One of the big inspirations brought to the University of Wisconsin Men’s basketball (16-6, 8-3 Big Ten) team before the contest with the No. 2 Michigan Wolverines (20-2, 9-2) was a message delivered by a guest speaker the day before what was bound to be an exciting and important matchup. In karate, the belt right under the black belt is the red belt. 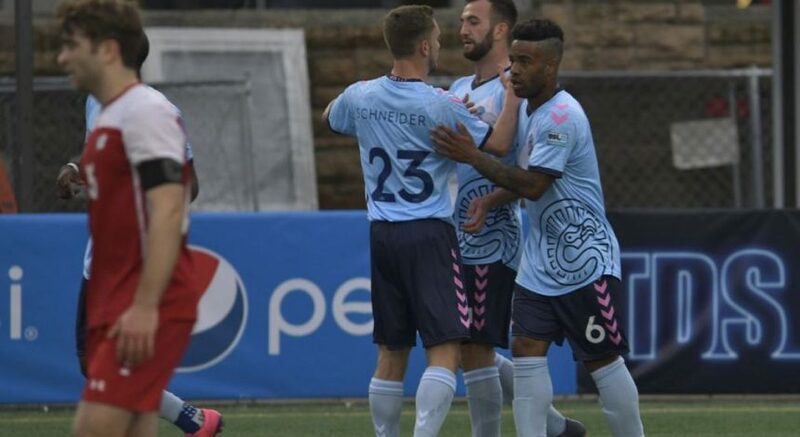 Anderson stressed to the team that is important to have a mentality of never being satisfied with the present, there’s always more to build toward and to stay hungry. Stay hungry the Badger did. As a wave of excitement came over the Kohl Center and Wisconsin fans everywhere, the Badgers used that Red Belt Mentality to dethrone the No. 2 Wolverines 64–54 Jan. 19. The students stormed the court in a celebration that was well earned by the underdog Badgers. Throughout the thrilling season thus far, Wisconsin has definitely endured its range of ups and downs, but taking the victory over Michigan leaves a lot of potential for this team to grow and increase their NCAA tournament resume. This win against the then undefeated Wolverines has acted as a spark to the Badgers as they have been on a five-game win streak ever since. It doesn’t come to a surprise that senior Ethan Happ was one of the key players in leading the Badgers to victory. Scoring 26 points while grabbing 10 rebounds and seven assists definitely made this game one of Happ’s best games and it couldn’t have come against a better team. Badger fans were definitely given the time to worry for their boys in red as their first-half play did not inspire great hopes of yet another top ten team being taken down in the Kohl Center. Throughout the first half, both the Badgers and the Wolverines shot poorly. The Wolverines started off with the lead in a very back and forth first half making 41.4 percent of their field goal attempts while the Badgers failed to match the mark only shooting 36.7 percent of their first-half shots. By the end of the half, Wisconsin trailed Michigan 27–25. Despite the struggle to get more points on the board while also being defensively sound, the Badgers managed nine assists and forced seven turnovers out of the Wolverines in the first 20 minutes of play. 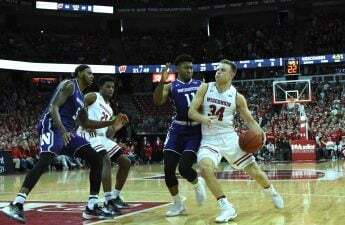 As the game progressed into the second half, the Badgers started to step up their game and build off of the electric Kohl Center crown, who wanted nothing more than a big mid-season spark to get this talented Wisconsin team back on track. As the Wolverines knocked down shots, the Badgers seemed to always have an answer. Keeping the score within one or two possessions was a theme for both teams in this game as both Michigan and Wisconsin went on small runs that were eventually checked by the opposing team. Much like Badger football, Wisconsin basketball is no stranger to leaving their games up to a nail-biting ending. Wisconsin extended their lead over Michigan by six points with just over a minute to play in the game. The last 60 seconds of this ultimate battle was inarguably one of the most captivating moments of this season for both Badger fans and the Badger players themselves. Within the last minute of play, Happ dominated the court and made one of two free throws making the score 58–54 Wisconsin. As he missed his second free throw, a Badger offensive rebound gave Wisconsin another chance to extend their lead. Once again the ball goes into Happ. After missing his first layup attempt and getting his own rebound, his second attempt was good for a six-point Badger lead. A Michigan turnover stolen by Happ and tossed ahead to Nate Reuvers sealed it for Wisconsin as an essential “victory dunk” brought everyone to their feet. A final steal off the inbounds pass by Brad Davison sent the Kohl Center into pure chaos. With only four seconds on the clock, the Badgers had beaten the unbeatable. As the clock timed out, the ecstatic Badgers who filled the Kohl Center quickly rushed to the court, celebrating what had just taken place. Taking down the No. 2 ranked Michigan Wolverines was a beacon of hope for Wisconsin after a tough losing streak through the winter break and certainly has served as a turning point for the rest of the season. The schedule of the upcoming season for the Badgers may pose a threat, or on the other hand, an opportunity for more great upsets. 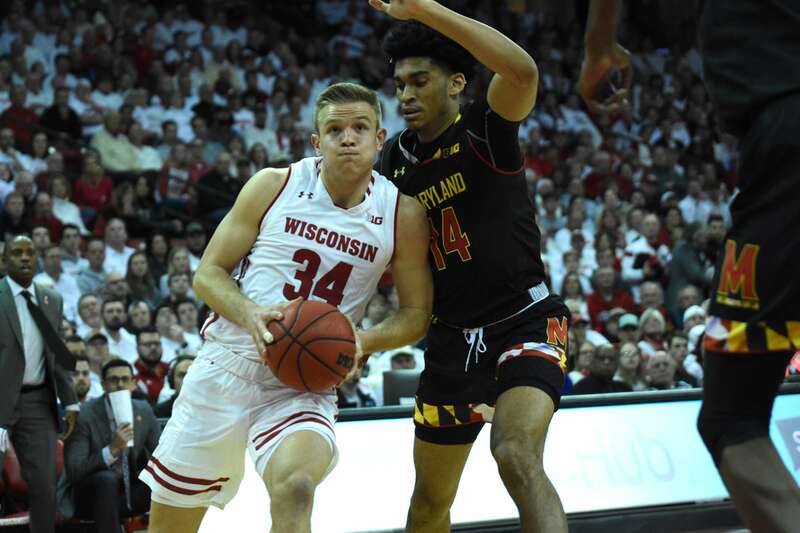 While the Badgers look to continue dominating Big Ten teams they have already edged out, they also look forward to upcoming second opportunities to get redemption on those they came up just short against. Nonetheless, anything is possible for this Badger team after a win like this. After missing the NCAA Tournament for the first time in nineteen years last season, it is no surprise the goal of this season to return to the tournament and restart that streak. But after this win, both Badger fans and the players themselves can envision a lot more out of this season than just a tournament appearance. Badger fans are calling for more from the players and the players are calling for more from the fans, as the players gave a lot of credit to the intense atmosphere during the Michigan game. The next three matchups for the Badgers will be the real tests of the season as they look to carry this five-game win streak momentum with them into the second round of the Big Ten. The Badgers will face Minnesota on the road Wednesday. Then, it is another match up with the No. 5 Wolverines in Michigan Saturday. The next home game will take place Tuesday versus No. 6 Michigan State.